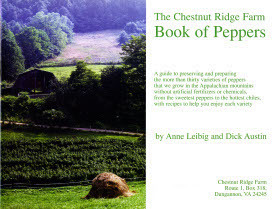 The Chestnut Ridge Farm Book of Peppers is a guide to preserving and preparing the more than thirty varieties of peppers that we grew in the Appalachian mountains without artificial fertilizers or chemicals, from the sweetest peppers to the hottest chiles, with recipes to help you enjoy each variety. Anne developed this sumptuous recipe to take full advantage of the extraordinary sweetness of "Horn of the Bull" and other long tapered sweet yellow and red peppers. When the peppers are fresh, this is truly food for the gods. Boil wild rice in 2 cups of water for 1 hour; and set aside. Cut tops off the peppers and slit part way down one side for access. Clean out seeds and membranes. Set aside. Make a bechamel sauce by melting butter in saucepan, stirring in flower, adding cream, and stirring until the sauce thickens. Blanche the peppers in boiling water for 5 minutes while you are combining the following ingredients for stuffing. Saute the mushrooms in butter. Add the basil, then the crab. Then add the bechamel sauce and continue to warm and stir while adding as much wild rice as needed to achieve the volume of stuffing required. Stuff the peppers and serve immediately, with the remaining wild rice on the side. Serves 6.